The strategy is a Chinese version of what Beijing has charged is a U.S. strategy designed to encircle and "contain" China. It is also directed at countering the Obama administration’s new strategy called the pivot to Asia. The pivot calls for closer economic, diplomatic, and military ties to Asian states that are increasingly concerned about Chinese encroachment throughout that region. "The Chinese are deftly parrying our ‘Pivot to the Pacific' with their own elegant countermoves," said John Tkacik, a former State Department Asia hand. Chinese President Xi Jinping is expected to question President Barack Obama about the U.S. pivot during the summit meeting set to begin Friday afternoon in California. Chinese state-run media have denounced the new U.S. policy as an effort to "contain" China and limit its growing power. The Chinese strategy is highlighted by Xi’s current visit to Trinidad, Costa Rica, and Mexico where he announced major loans of hundreds of millions of dollars that analysts say is part of buying influence in the hemisphere. U.S. officials say the visit to the region has several objectives, including seeking to bolster Chinese arms sales to the region amid efforts by Russian arms dealers to steal market share. States including Venezuela, Ecuador, Bolivia, and Mexico recently purchased Chinese arms but are said to be unhappy with the arms’ low quality. For example, Chinese YLC radar sold to Ecuador in 2009 did not work properly and sales of Chinese tanks to Peru also ran into quality problems. Both states are now looking to buy Russian weaponry, a U.S. official said. Venezuela, a key oil-producing U.S. adversary, announced Thursday that China agreed to a $4 billion loan for oil development. And in Mexico this week, Xi announced China is extending a $1 billion line of credit for oil development and pledged another $1 billion trade deal. A joint Mexico-China statement said Mexico pledged not to interfere in China’s affairs on Taiwan and Tibet, a reference to the previous government of Mexican President Felipe Calderon who in 2011 invited exiled Tibetan leader the Dalia Lama, a move that angered Beijing. U.S. officials say there are concerns that the pro-Beijing shift by the current government of Mexican President Enrique Pena Nieto, who visited China in April, will be exploited by China for such political goals, and could be used to generate support for China’s claims to Japan’s Senkaku Islands. U.S. officials said there are growing fears that some type of military confrontation could break out between China and Japan over the disputed islands that are said to contain large underwater gas and oil reserves. North of the U.S. border, Canada this week concluded a military cooperation agreement with China during the visit to Beijing by Canadian Defense Minister Peter G. Mackay. The agreement calls for closer cooperation between the two militaries, including bilateral military exchanges. Chinese ambassador to Canada Zhang Junsai said China is deepening ties to Canada for infrastructure development, in Calgary last month. Chinese state-run companies have spent $30 billion for Canadian oil sands and natural gas, he said. At a security conference in Singapore last month, the commander of U.S. military forces in the Pacific, Adm. Samuel Locklear, confirmed the earlier disclosure by a Chinese military officer that China’s military has been conducting naval incursions into the 200-mile U.S. Economic Exclusion Zone around U.S. territory. The locations of the incursions were not given but they likely included submarine or warship visits to the western Pacific island of Guam, a key U.S. military base. A Chinese military official initially stated at the conference that the incursions were part of a People’s Liberation Army Navy effort at "reciprocating" for frequent U.S. Navy transits through China’s 200-mile EEZs along the coasts. The zones are technically international waters and China has claimed U.S. transits are "illegal" under international law. It is not clear why China is conducting naval operations it considers illegal for its maritime boundaries inside U.S. EEZs. "They are, and we encourage their ability to do that," Locklear said, without explaining why the activity was encouraged or where the Chinese vessels had transited. Larry Wortzel, a former military intelligence official and specialist on China, said the Chinese military has sent intelligence collection ships into Guam’s economic zone and also the zone around the Hawaiian islands. "The EEZ transits may indicate that in the future they could revise their position on the Law of the Sea and military activities," Wortzel said. Wortzel said he does not see China’s efforts in South and Central America as a counter to the U.S. Asia pivot. Chinese arms sales, military exchanges, investment and developmenet has been underway for a decade, he said. The Financial Times, which first disclosed the Chinese EEZ forays, quoted one Chinese military source as saying, "we are considering this as a practice, and we have tried it out, but we clearly don’t have the capacity to do this all the time like the U.S. does here." On Chinese inroads in the western hemisphere, Rick Fisher, a China military affairs analyst, said China is moving strategically on Latin America, working methodically as part of a decades-long effort to build economic and political clout there. "It has cultivated far better military relations with the openly anti-American regimes in the region and could become a sort of political-economic godfather to ensure the survival of the Castro dictatorship system in Cuba," said Fisher, with the International Assessment and Strategy Center. Intelligence cooperation with Cuba is "substantial," Fisher says, and will expand sharply in the region through the activities of its state-run telecommunications firms such as Huawei Technologies and ZTE in the region. China currently is "promoting almost all of its non-nuclear weapons in that region," Fisher said. "It has promoted the Chengdu J-10 4th generation fighter in Venezuela and Argentina, and even Peru may be considering the J-10 for its future fighter program," he said. A State Department spokeswoman declined to comment. At a recent arms expo in Peru, China was selling a 22,000-ton helicopter amphibious assault ship and an export version of its relatively advanced Yuan-class attack submarine. In Venezuela, China is helping the Caracas government circumvent U.S. arms embargoes by helping repair Venezuela’s U.S.-made gas turbine engines on frigates, he said. "Another company was marketing several short range ballistic missiles—with no apparent consideration about how it might promote a regional missile arms race," Fisher said. "The basic U.S. policy is to ‘welcome’ China's growing influence in Latin America but it is now time for Washington to use both positive and negative pressures to limit China's strategic military reach into this hemisphere." Tkacik said China is quietly evolving on the global stage and implanting itself across the map with major overseas Chinese communities. "And if they [Chinese nationals] get in trouble, as they did in Libya in 2011, China's navy and air forces can coordinate to support them," he said. "This support of émigré Chinese communities around the world has become an overt dictum of China's new security policy." China also has set up commercial bases in key chokepoints around the Caribbean, through its Chinese-run port facilities in Panama, Bahamas, Trinidad, and Venezuela over the past decade. Tkacik said those facilities are partly aimed at drawing American attention and easing U.S. geopolitical pressure in Asia. China also is investing heavily in Africa, the Middle East, and Indian Ocean region. "At bottom, however, China's strategic targets are closer to home: East Asia, Southeast Asia and the Pacific," Tkacik said. "That's why Washington's Pivot to the Pacific unsettles Beijing so. 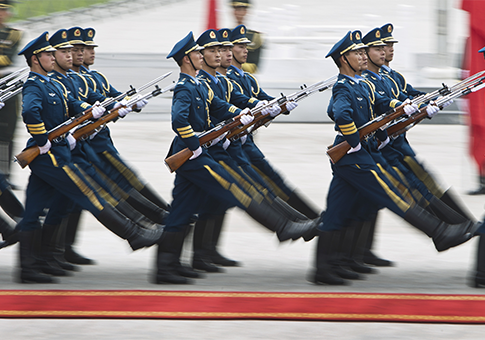 It threatens to check Beijing's rising new influence in the Asia-Pacific. Tkacik said Chinese naval patrols in U.S. economic zones have been carried out for years through Chinese ocean fishing fleets. "It doesn't need to send out military vessels to Guam or Hawaii or the Aleutians except to ‘tweak' the U.S.," he said. This entry was posted in National Security and tagged China, Middle East. Bookmark the permalink.